When Hurricane Harvey blew into Houston, Texas, in August of 2017, it altered everything in its path, causing at least $125 billion in damages and claiming 108 lives. More than 1,350 miles away, Harvey continued to effect change, motivating those planning Penn State Behrend’s Alternative Spring Break service trip to veer off course. “We had spent all summer looking for a trip that would focus on homelessness, but once Harvey happened, we felt that the need for volunteers would be more prevalent in the south,” said Elizabeth Mamros, a senior Mechanical Engineering major and president of Reality Check, the service club that orchestrates Alternative Spring Break each year. “We got in touch with Community Collaborations International, a company that coordinates experiential education projects, and they already had people there assessing the volunteer situation and potential projects for spring break,” Mamros said. Twenty-four students and four advisers will be leaving Behrend early Saturday morning to spend a week working in Beaumont, Texas. “I think students are going to be surprised at the disarray that still exists six months after the hurricane. Most people have forgotten about it or assume it’s all cleaned up by now,” said Chis Fox, assistant director of civic engagement and the Smith Chapel. “But there’s still plenty of work to be done, especially in less populated and less affluent areas. The Behrend group will be joined by students and advisers from other Penn State campuses, including Greater Allegheny, Harrisburg, Scranton, University Park, and York. In total, 100 Penn Staters are expected to be in Beaumont next week, helping residents recover from the catastrophic flooding that occurred as a result of Hurricane Harvey. Teams of students will be dispatched to various sites around Beaumont to work on projects ranging from mucking out and gutting flooded homes to cleaning and reconstruction. Groups will stay in the Community Collaborations International Volunteer Facility, and sleep in a gym or classrooms with men and women in separate quarters. Volunteers will work, rain or shine, and time will be spent each evening reflecting on the work of the day. Penn State Behrend students attending are: Emily Archer, Hannah Carlino, Seth Cowen, Safinaz Elhadary, Joshua Hecht, Janelle Housler, Ashley Jankowski, Ashlyn Kelly, Kris Knorr, Nicole Kuhn, Kaitlyn Lacey, Max Magera, Celeste Makay, Liz Mamros, Kelly Miller, Angelica Miller, Katie Murphy, Priya Patel, Pearl Patterson, Brianna Riley, Gretchen Shaffer, Alex Sienerth, Lidong (Thomas) Wang, and Danielle Wieczorek. The four staff members who volunteered to accompany the students are: me — Heather Cass, publications manager in the Office of Strategic Communication; Chis Fox, assistant director of civic engagement and the Smith Chapel; Chris Harben, assistant teaching professor of management; and Will Taylor, an Americorps VISTA intern at Penn State Behrend. Behrend’s ASB group have been preparing for the trip by discussing the disaster in Texas and relief efforts, participating in safety and basic maintenance workshops, and watching Trouble the Water, a documentary about the devastating flooding that occurred in New Orleans’ 9th Ward after Hurricane Katrina. They have also been taking part in ice breakers and other activities to get to know one other better. Check back here….or follow this blog (click on the “follow” button in the lower right hand side of your screen)…to see updates from Texas all next week. Note: If you wish to support the students efforts in Texas with a donation to the Alternative Spring Break Program, contact Kathryn Buesink, assistant director of development, at klb44@psu.edu. Rare is the college student with spare time on their hands. After attending classes, studying, completing assignments, and working at a job or internship, students have precious few hours and little energy left. 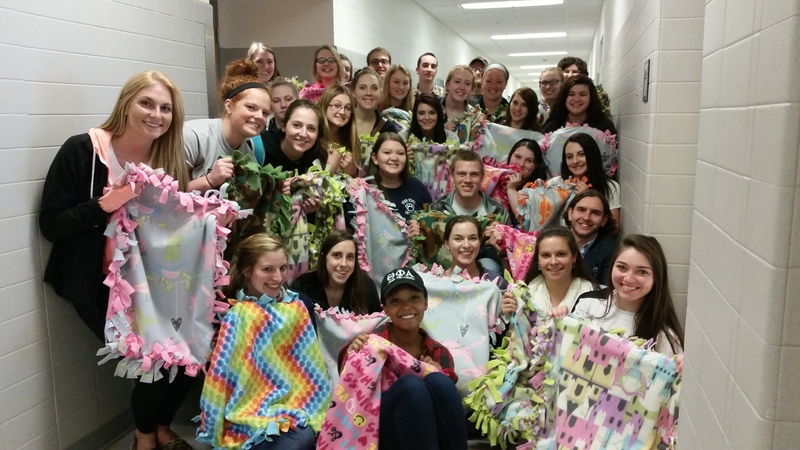 Yet some Penn State Behrend students still make helping others a priority. They say service work is not draining, but inspiring and rejuvenating. There are at nearly a dozen service-focused clubs at Behrend, and many more student groups and organizations that include service projects as part of their regular activities. Overby first became involved with Kiwanis in high school. Behrend’s Circle K club includes twenty members from a variety of backgrounds. Among the group’s endeavors this academic year: cleaning wheelchairs and gurneys at Saint Vincent Hospital; participating in Relay for Life; helping at the Kiwanis’ antique show and bowling night; volunteering at Holy Trinity soup kitchen; taking the Special Olympics’ Polar Plunge; raising funds through the college’s Cardboard City event; cleaning up several local highways; and assisting at Meals on Wheels. Most recently, Behrend’s club hosted the Circle K Club’s spring officer training, drawing newly elected club officers from several colleges in the area including Mercyhurst and Edinboro Universities and the University of Pittsburgh at Bradford. There was, of course, a service project embedded in the day’s activities. Attendees assembled and prepared coloring books to give to Shriner’s Hospital for Children in Erie. Overby, who is majoring in Accounting will be doing an internship at Bank of America in New York City this summer. She expects to graduate in December and sit for the CPA exam before returning to Behrend to earn her M.B.A. While Overby is still pondering the area of accounting she wants to focus on, she’s sure of one thing: She will continue her service work in the future. Circle K meets bi-weekly on Tuesdays at 8 p.m. in Burke 105. To get involved, come to the next meeting on February 28 or email Overby at nmo5050@psu.edu.